This is such an easy, flavorful meal and it is cooked in one skillet. I love one pan/skillet meals. Most cooks I know love to cook, but hate the clean up. I fall into that category. So if I can make a meal with little cleanup I am all for it. What is so nice about this is that it has only 7 ingredients and most of them you probably have on hand. I thought I would take advantage of the last of the apples that are in season and make this delicious meal. Heat a large skillet over medium heat. Add 1 1/2 tsp oil to pan. Pat dry pork chops with paper towel. This helps the pork chops to get a good sear. Sprinkle pork chops evenly with half the seasoning. Add pork chops to pan; cook each side until golden brown. Remove from pan. Combine broth and mustard; stir well. Add remaining oil to pan. Add apples and onion to pan. Sprinkle remaining all-purpose seasoning onto apple mixture; stir. Cook apple mixture about 4 minutes, stirring occasionally. Stir in broth mixture. 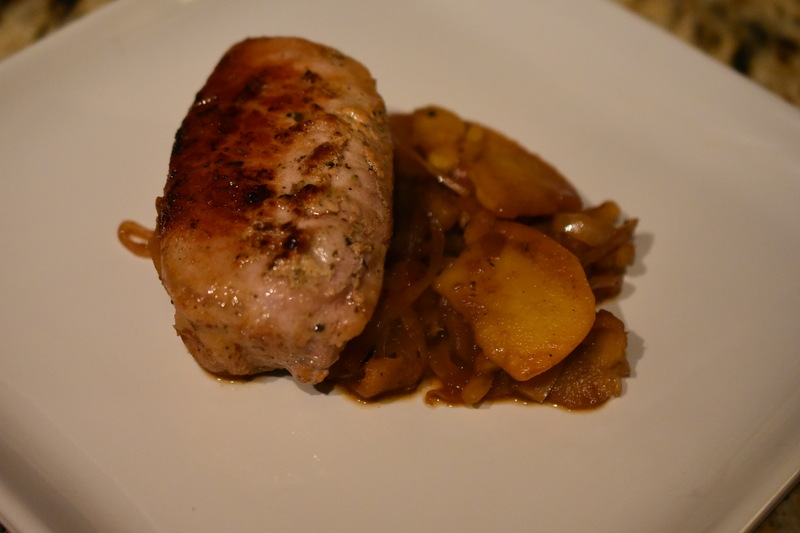 Return pork chops to pan, cook until liquid is reduced by half.